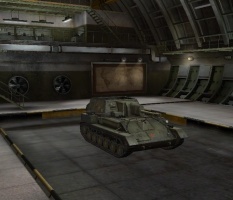 The SU-85A is a Soviet tier 4 tank destroyer. In April-May of 1943, the SU-85B tank destroyer designed by the Gorky Automobile Plant underwent trials. The vehicle was a modernization of the SU-85A and featured the artillery LB-2 gun, 160-hp engine, and SU-76M chassis. The cabin, drive wheels, and spare parts kits were redesigned. Only one prototype was built. It is very similar to the SU-76 in characteristics, except that it mounts a larger gun and has a greatly increased gun arc. Though not the fastest, it still proves effective speed for tier 4 TD. The SU-85B is able to perform reconnaissance with intent to survive, unlike others that are often-times destroyed. Should you see someone noteworthy, many players choose to remain hidden and keep the target marked for attack. With a top speed of 43 km/h, and a view range of 310m, it has the ability to fire over long ranges and get away faster than most tanks in its tier, making it a great tank for sniping or hit and run tactics. Either way, should you choose to scout or attack, the AP round is able to make quick work of low-tier tanks, and damage some larger ones. The SU-85B is able to mount the D-5S 85-A and LB-2S guns, shooting 85mm rounds at a relatively high RPM. As a TD, the 85B also has a camouflage bonus. All this comes at the cost of HP and weak armour, meaning it can not really hold up to a lot of punishment. The stock gun on 85B is the top gun of the SU-76, and is highly recommended to upgrade the gun quickly to the 85 mm D-5S-85A, and then to the 85 mm LB-2S. Update 9.6 reduced SU-85B's view-range from 390 to 310 meters. Now it should be better to stay behind, abandon scouting and accept the switch from delivering direct fire to relying on your allies' spotting skills. The SU-85A leads to the SU-85. Extremely good top gun in most categories, equivalent to a Tier V TD or Tier VI tank guns. The SU-85B is a long range sniper, much like its predecessor the SU-76M. Compared to his predecessor it has a better engine and a bigger punch, but it sacrifices top speed, accuracy, gun depression and elevation for it. The SU-85B has much less problems with fast light tanks, partly due to its better performance and higher health, partly due to the fact that it will usually face larger and slower opponents. Due to its much better acceleration it feels much more nimble and is able to reach its top speed within a few seconds. It has a wider gun arc at the expense of less gun depression and elevation, which diminishes its performance on hilly ground. 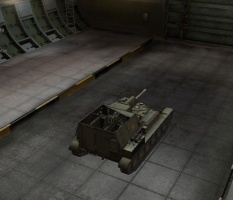 The SU-85B is one of the few tanks with such a small gun elevation that it feels like a handicap. While playing the SU-85B you should always remind yourself that you're driving a small but fast tin can with a huge gun. Your only defences are your good camouflage and good mobility, so don't hesitate to run away if the enemy comes too close or when its foreseeable that the situation will turn against you. Your biggest vulnerability are HE shells, as you will usually die from the first hit. 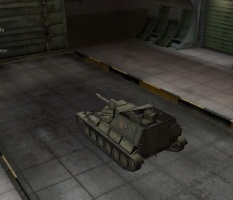 Consequently, the SU-85B is a common victim of arty fire, forcing the player to change position every few shots. This isn't too much of a penalty as its awesome gun not only allows to snipe effectively but it can also kill most enemies within 2-3 shots, making the SU-85B a formidable ambusher. The 57mm gun carries over from the SU-76. Install it immediately as you will need the penetration. The 9RM radio also carries over from its predecessor. Research the engines first, as they are inexpensive and give you great mobility. If you stay with the 57mm after researching the first 85mm is a matter of play style. Don't skip the second 85mm, or you will miss out on the best gun for any tier 4 tank. The SU-85B (really the GAZ-74b), was a prototype based on the SU-76. The second variant (GAZ-74b), was similar to the SU-IT-76, recommended by NII-13. The vehicle had a low silhouette, was well-armoured (45mm glacis plate) with sloped armour, and was armed with the 76 mm S-1 Gun (the same gun was mounted on the serially produced SU-76i). 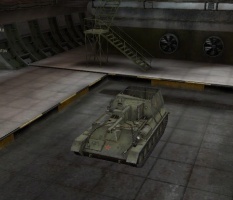 The new tank killer was to receive the GMC-71 diesel engine. The GAZ-74b was built, underwent factory testing, and on the whole approved by military personnel. Under the designation SU-76-I (not to be mistaken for SU-76i) or SU-74, it was subjected to government tests. However, in 1943, the arming of these vehicles with the 76 mm gun with a long barrel (41-calibres) was already considered inadequate for combat with heavy German tanks. The cost significantly exceeded that of the SU-76, which was already being mass produced. Therefore, the fate of the GAZ-74b was sealed. This page was last modified on 6 September 2017, at 02:03. This page has been accessed 19,375 times.